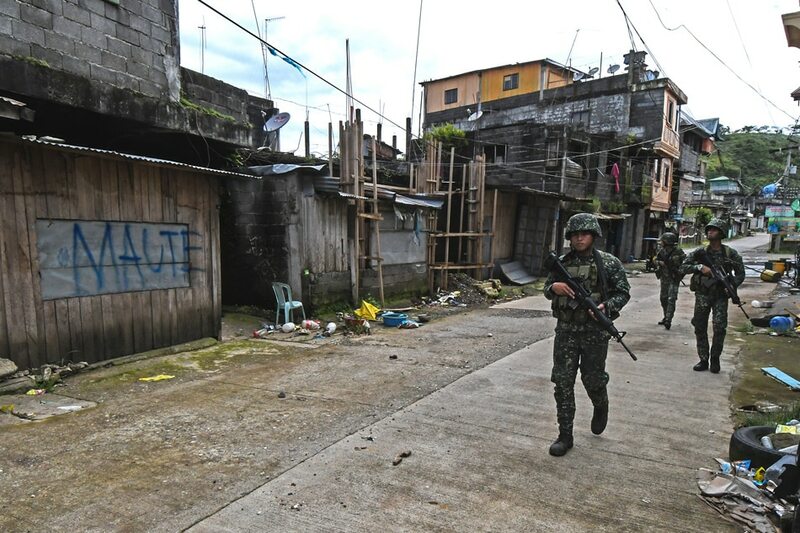 Singapore is helping the Philippines train its troops in urban warfare as part of its offer of counterterrorism assistance earlier this year to help Manila tackle an Islamic insurgency on the southern island of Mindanao. Two months after the Philippines declared the end of five months of military operations against Islamic State-inspired militants who had seized parts of the southern city of Marawi, some 40 soldiers from the Philippines are in Singapore to take part in an "urban operations professional exchange" with Singapore troops. The 12-day training from Dec. 4 to Friday is being held at the Murai Urban Training Facility in a remote northwestern corner of Singapore. It culminated in an urban operations exercise on Tuesday involving about 20 troops each from Singapore and the Philippines. Col. Liew Kok Keong, commander of Singapore's Infantry Training Institute, told reporters invited to watch the drill that the urban operations training "allowed the Philippines' army to continue honing their skills in urban operations under a complex operating environment." The Philippine troops also shared with Singapore their counterterrorism efforts in Marawi, he said. Machine-gun fire, small explosions and grenade smoke filled the air as troops tried to capture a building from the "enemy" in Tuesday's drill. According to the Singapore Defense Ministry's website, the city-state's army has been developing its urban operations capabilities and is well equipped with the high-tech weaponry for urban warfare. The facility used Tuesday is equipped with video monitoring and recording functions, and a control tower built for after-action reviews, and a variety of battlefield effects simulators which can create noise and blast effects, to further enhance training realism. It has been used for bilateral and multilateral exercises, such as with the United States, Thai and Indonesian armies. "With increased urbanization in the world, it is getting more challenging to combat terrorism in urban areas which we have witnessed in the Marawi crisis," Liew said. Singapore Defense Minister Ng Eng Hen in July this year offered the Philippine army the use of the Singapore military's urban training facilities. The Murai Urban Training Facility is located in a remote part of Singapore where there are cemeteries and small agricultural plots. As it has only small empty buildings and none of the high-rise buildings found in other parts of Singapore, it has more of the rustic air of a countryside than a bustling city. Liew said the exchange "will strengthen the cooperation in our counterterrorism efforts and improve the security of our region." Maj. Edwin Mirador, the head of the Philippines' delegation and also commandant of the Counter Terrorist Development Training School, was quoted in the statement as saying that the exchange has allowed the Philippines to "share knowledge on the Marawi operations and adopt training procedures for learning."